NEW DELHI—Hundreds of homeless people continue to die on Delhi’s streets during the winter, leading some aid workers to call cold season in the capital region an ignored annual disaster. According to the Center for Holistic Development (CHD), a consortium of 20 NGOs, 679 unidentified people died in Delhi between November and the first week of January, 80 percent of which the organization believes were homeless. Despite more shelters, the number who dies every year hasn’t changed much. In 2013, 618 died during the winter months, while in 2012, 640 people died, according to the Center for Holistic Development. 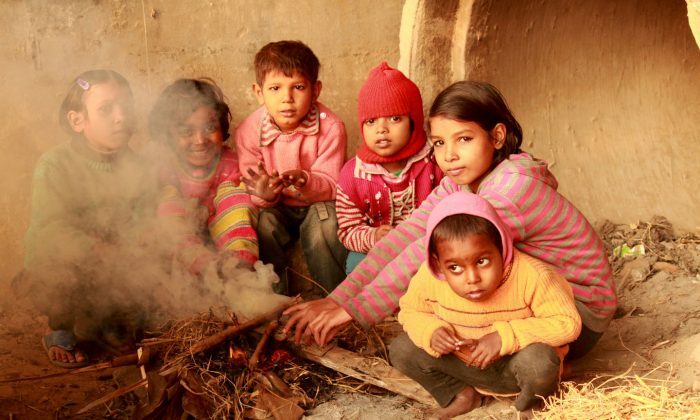 “It is a preventable disaster because all that the people on the roadsides, homeless people in far flung villages, or disaster struck people, need are woolen clothes and blankets,” said Anshu Gupta, the founding director of Goonj, an NGO that provides clothing to people in need. It is a preventable disaster. This was most likely the case for a middle-aged man wearing cotton pants and a badly tattered jacket. 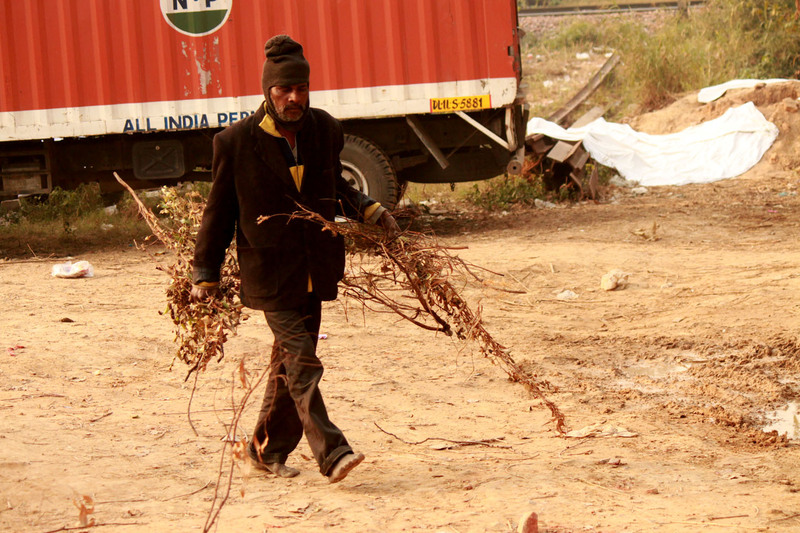 He was found on a footpath in December, Delhi’s coldest month, and his body was brought to a night shelter. A doctor pronounced him dead upon arrival. “We suspect he died of cold,” said Dharmendra Kumar, the secretary of the NGO Janpahal that manages the shelter. But Sunil Kumar Aledia, a founding member of the Center for Holistic Development, said more than clothes are needed to keep these people from dying on the streets. “These people died because of a lack of shelter, congestion in the existing [shelters], communicable diseases, cold, and no medical aid,” he said. Unlike other natural disasters, there aren’t comprehensive records of the number of people who die or face hardships as a result of winter, said Gupta. The number of homeless in Delhi is also not well documented, but even the most conservative estimates show that there is not enough shelter for all of Delhi’s homeless. A report by the Delhi Urban Shelter Improvement Board (DUSIB) said there are 257 night shelters in Delhi with a capacity to shelter 18,940 people. According to various government and NGO sources, there are between 40,000 and 100,000 itinerants in Delhi, and even this wide-ranging estimate could be off as different surveys have produced very different estimates over the years. The lack of shelter is just one problem though. Gupta said that a lot of homeless will not go to shelters even when they are available because they are used to life on the streets and don’t trust the overcrowded and sometimes unsanitary shelters that lack basic facilities. Fear of personal property being stolen is another deterrent as few shelters have places to lock up personal items, he said. Delhi’s homeless problem stems mostly from the migration of people from north and central India who come to Delhi looking for work. Most of them are unskilled laborers who end up working construction, driving bicycle taxis, or in homes as cleaners. Their wages allow them to feed themselves and buy a few other basic necessities, but housing is often an expense they cannot afford. According to Sanjay Kumar, the director of operations for Aashray Adhikar Abhiyan, another NGO working with the homeless in Delhi, the influx started after the liberalization of the Indian economy in the early 1990s. The Delhi government and civil organizations have struggled with this influx of unskilled labor, especially finding shelter for those who come with families. Most night shelters are single gender only, and some parents have avoided these shelters because they don’t want their children to be exposed to drunks and drug addicts that stay there. At a shelter that was recently allocated for families, Neelam Yadav, 25, her husband, and three children are waiting to move in. She and her family moved to Delhi from Uttar Pradesh, a state in northeast India, and were living in a tarpaulin shelter for three months under a nearby bridge. “[My husband] doesn’t get work daily. At times he earns 150 rupees ($2.40) and sometimes 400 rupees ($6) [a day],” she said. Some tents are provided for families so they can have some privacy and get out of the elements, but they are far too few, and permanent shelters for families are even fewer. Earlier this month, Delhi’s Lt. Gov., Najeeb Jung, ordered the Delhi Urban Shelter Improvement Board (DUSIB) to open more night shelters. “The period till the second week of February is critical for homeless people,” Jung said, according to local media reports. He called on Delhi citizens to donate warm clothes, blankets, and other winter necessities so that those living on the streets would not freeze, if not stay warm.